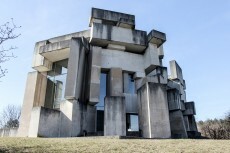 Located at the very edge of Vienna, where single-family houses give way to the Vienna Woods, Wotruba Church stands out as an abstract, oversized sculpture. Given that it was designed by the sculptor Fritz Wotruba, it does not come as a surprise that children feel tempted to climb the concrete blocks and visitors describe the feeling like walking into an enlarged sculpture. The church was conceived in 1964, but the construction only took place a decade later between 1974 and 1976 by the architect Fritz G. Mayr. So Fritz Wotruba, who died in 1975, has never seen it completed. However, Wotruba’s aim to “design something that shows that poverty does not have to be ugly, that renunciation may be in an environment that is beautiful despite the greatest simplicity” seems to have worked out. 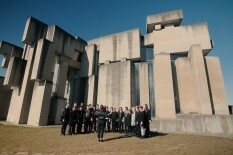 Against all initial scepticism the Brutalist church consisiting of 152 asymmetrically arranged concrete blocks is nowadays a popular destination.